KBJ Architects and Beers Construction teamed together for this Design/Build project. The scope of the Residence Hall Expansion includes seven residence halls and five community buildings totaling 221,000 gross square feet and a total of 736 beds arranged in two and four bedroom apartments. The primary component of the building program is the 170 four-bedroom apartment units and the 24 two-bedroom apartments. These elements have been grouped into seven buildings, creating four residential courtyards, which incorporate existing residence halls of the Argos and Andros housing complexes. Each building is either three or four stories, and the apartment units are arranged so that there are two “quads” with four apartments per floor surrounding an exterior circulation and social area. An exterior corridor leading to a central stair and elevator core connects these two quads. Two Commons Buildings have been incorporated into the northeast and southwest residential quadrants. These Commons Buildings house functions of laundry, group study, housekeeping, student storage, public toilets, building systems and communications. 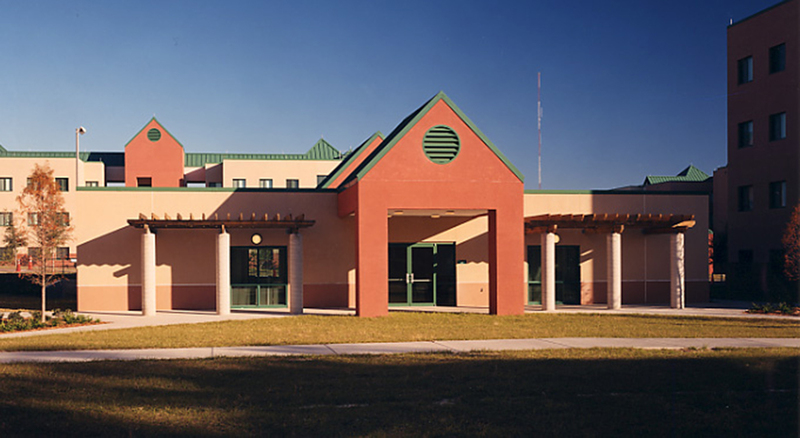 The North Commons Building also includes a security police office and computer room, while the South Commons incorporates a mailroom.